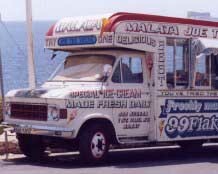 When looking for ice cream van insurance we would highly recommend using our partners to access a wide range of quotations. Ice cream van insurance is a specialised area, and there are a number of potential ways of arranging your policy which can make a considerable difference to the premiums charged. The panel of ice cream van insurers we work alongside will offer you quotations tailored to the type of use you require. They can also take advantage of different features some insurers offer, if they are felt to be of benefit to you. Without seeking quotations from a range of companies, you may not be aware of the possibilities, as often a single company or broker will only make you aware of the details their particular policy offers. To get the widest choice of quotations simply fill out your details below, or alternatively, if you prefer, call for a quote over the phone. Companies able to offer telephone quotations include Autonet (0800 080 5295 quoting reference 9032) or Insurance Choice (0843 2270120). If you are a member of a trade body, can your policy costs be reduced? You can choose between Comprehensive, Third Party Fire & Theft or Third Party only cover when taking a policy, but do check out the saving you are making if opting for a Third Party policy - often they are surprisingly small.